El tiempo futuro, como con todas las demás estructuras gramaticales vistas en esta serie, también admite las famosas Tag Questions o "preguntas coletilla". 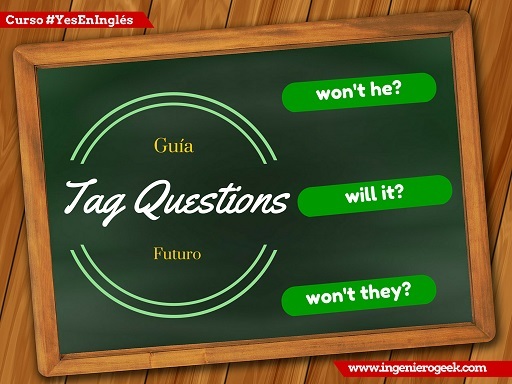 1.- Con el auxiliar "Will"
2.- Con la forma "Going to"
Los ejemplos de Tag Questions en tiempo futuro estarán determinados por estas dos formas principales. George will be in the party, won't he? The car won't be at the paint shop today, will it? Laura is going to be in the team, isn't she? The Smiths aren't going to be on vacation next week, are they? Sebastian will cancel the shipment, won't he? The students won't use a list of verbs in the exam, will they? The store is going to open early, isn't it? We are going to watch a movie tonight, aren't we? Sophie and Sam will be working in the same office , won't they? The teacher won't be taking more participations, will he? That dog is going to be barking all night, isn't it? The children aren't going to be paying attention, are they? Lori will have bought the gifts before christmas eve, won't she? The employees won't have finished the tasks by 5:00 pm, will they? The game is going to have started when I get home, isn't it? The policies aren't going to have changed until next month, are they? Next Monday, Jessica will have been living in this country for five years, won't she? The new services won't have been working until next version, will they? The users are going to have been testing the software for two months before we release it, won't they? By the end of the month, Alice is not going to have been eating meat for a year, is she? Un tema bastante extenso mas no imposible de dominar. 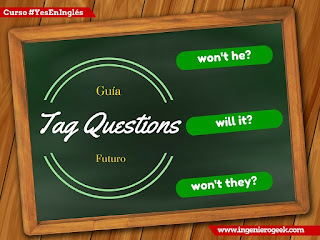 Las “Tag Questions” con oración principal en futuro se forman, como en todos los demás casos, con el auxiliar opuesto y contraído de la declaración original. 3.- Tag Question presente de "Be": aren’t I?, amn’t I? o ain’t I? Futuro simple en inglés uso de auxiliar "will" y forma "Going to"